Start date: Sunday, September 15 2019.
a year-long exploration of nature connection and skill building through sensory awareness, storytelling and play. 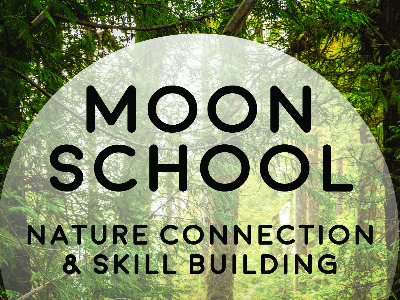 Moon School is a time to play and learn in the woods with other adults, intended to inspire reverence for the natural world, cultural transformation, and right relationship with each other and the land. Each session, there will be a welcome circle, singing, and nature connection games, as well as focused learning around plant and tree identification, medicine making, tracking, fire making, and some inner tracking through storytelling, deep listening, discussion, and journaling. Sessions are crafted to reflect seasonal species and activities. This activity allows for drop ins. Pick your choice in the calendar to register.